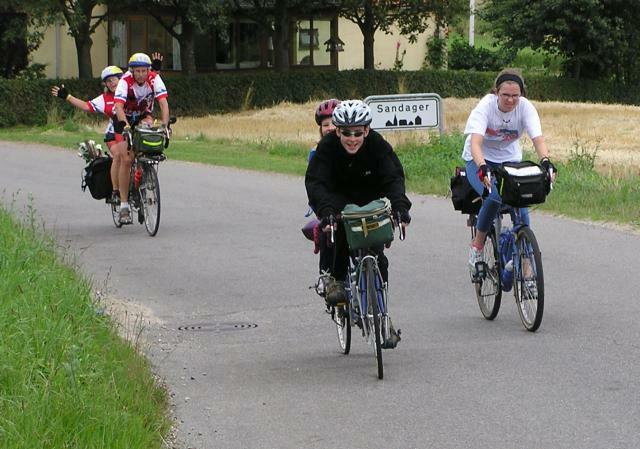 Having arrived at the tandem rally a day early, we along with others helped out in reception. Ceri-Siân is in the background sorting out the tee shirts. The first Saturday of the rally was a nice day. 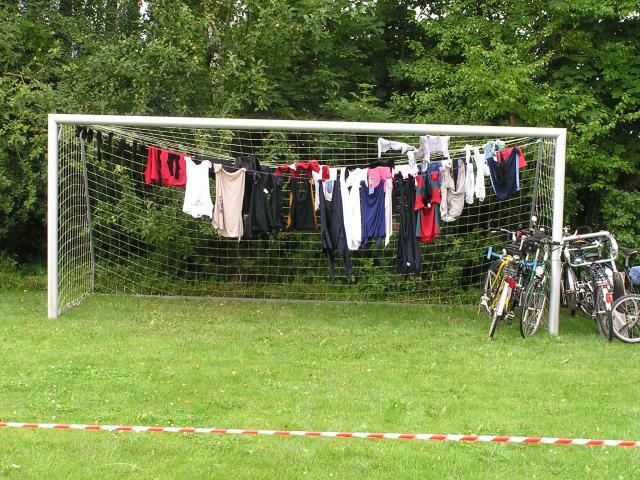 However I am not in to hand washing, so I asked the local football team who were training, where the nearest laundrette was. I was told in Aarup, about 5 miles way. 11 miles later I arrived in Aarup on my bike with a weeks worth of washing for two, only to find the laundrette had closed 3 years ago. So I ended up buying a box of soap powder and resorted to hand washing. The rally was held at the Tommerup Stationsby football club. One advantage was that there were several pairs of goal posts, including one behind were we camped which made useful washing lines and cycle park. 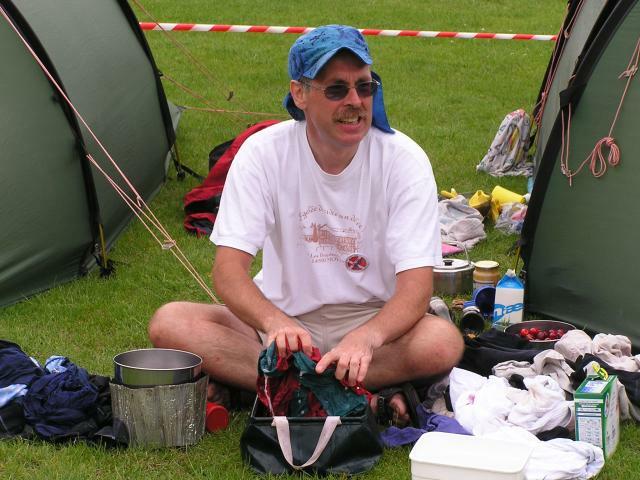 The only problem was, our goal posts was sheltered from the wind so the washing did not dry very well. I had washed my pyjamas, and they were still damp, so I put theory to test and wore them to bed. They soon dried in the night! 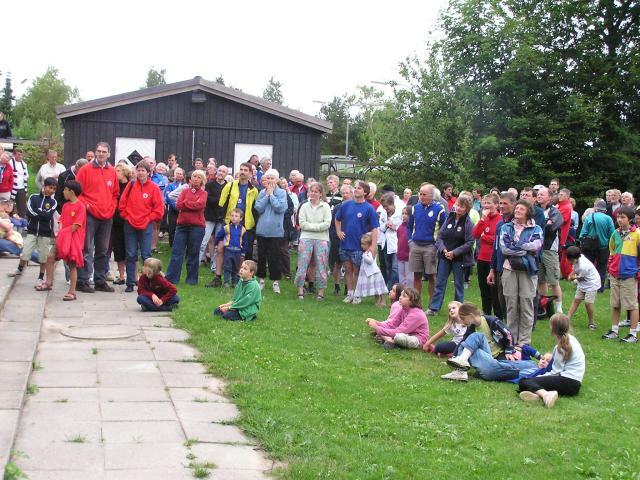 Saturday evening there was an official welcome by the mayor of Tommerup. 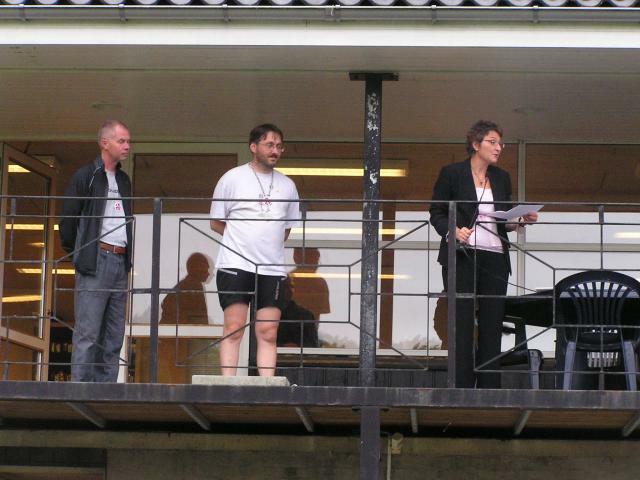 She is seen on the balcony of the football club house giving her welcoming address along with David Holman and Lars Fribo who co-organised the rally. The rally attendees listen to the welcoming speeches and domestic announcements. Sundays ride look us into Aarup. 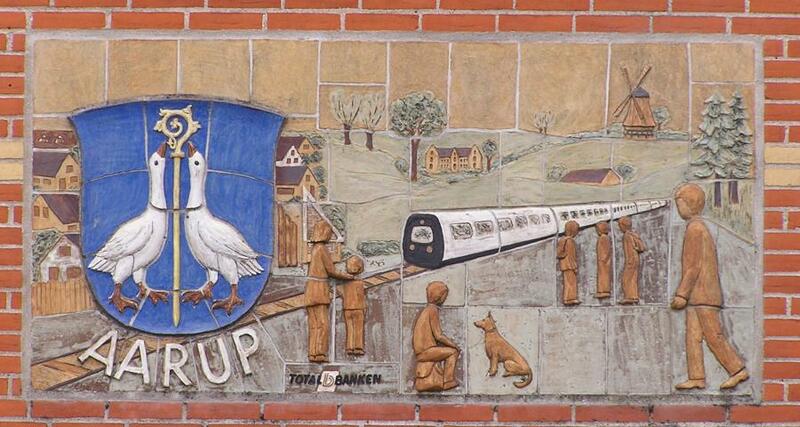 The station had been modernised recently and there was a very nice tiled mural on the station wall. It is not what one expects to see on a modern functional building of a "local unstaffed" railway station. 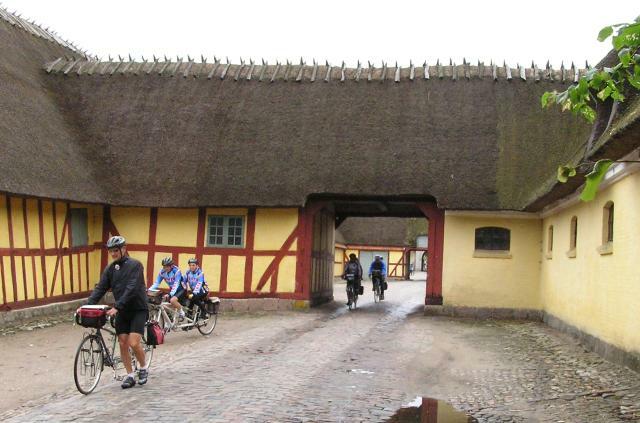 From Aarup we headed through Sandager to Assens on the coast. 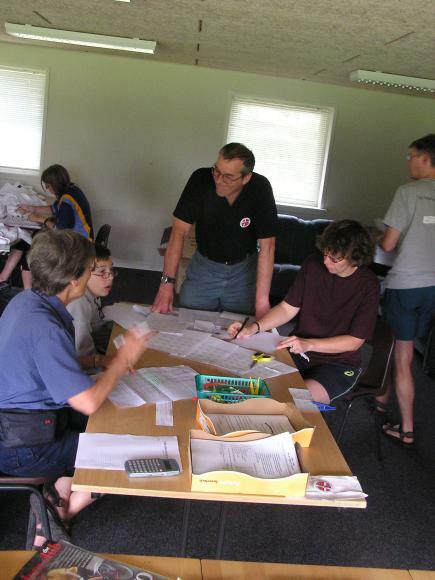 We had started as large group with several families. However for various reasons the group split up, and Ceri-Siân rode off with Carwyn and Megan Davies, leaving their mum and dad miles behind, as they had a puncture. It was hard work catching Ceri-Siân up. Just behind are Pat and Mike Strauss who caught us up. 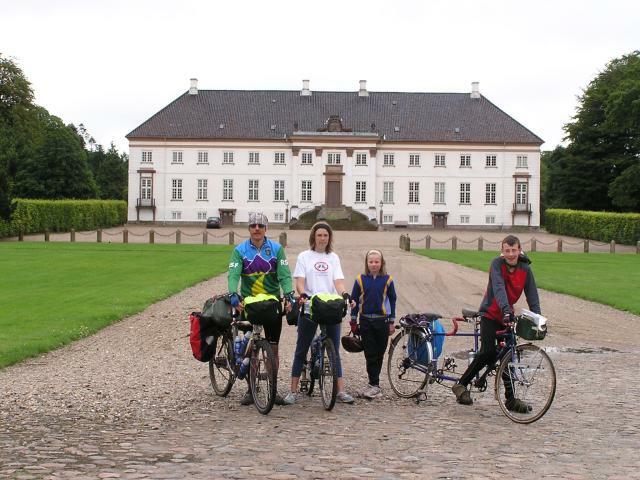 We rode in to Assens, had lunch, and waited and waited for Megan and Carwyn's mum and dad to catch up. In the end we gave up waiting as we had heard they had taken the wrong choice in trying to take a short cut and catch up with us. 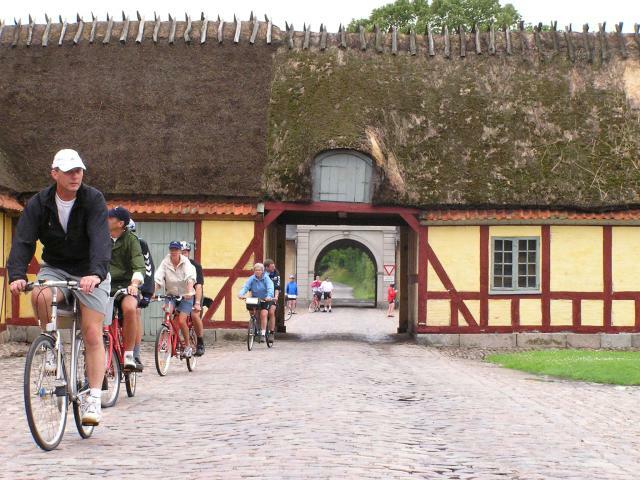 We eventually met up with them as we were heading out of Assens. 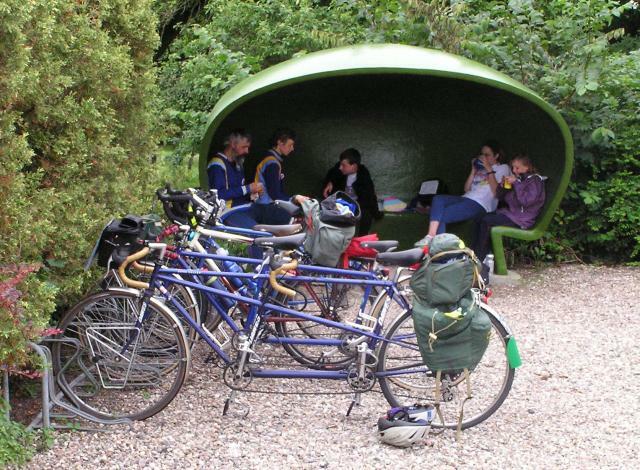 As they had not had lunch we had a second lunch and brew up in a bus shelter at Gamtofte. What struck us is that many bus stops had cycle racks by them. 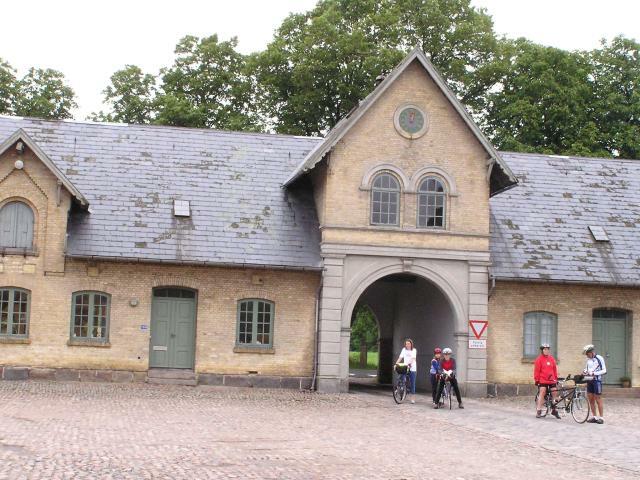 The oyster shell bus shelter was also a common feature in many Danish towns and villages. 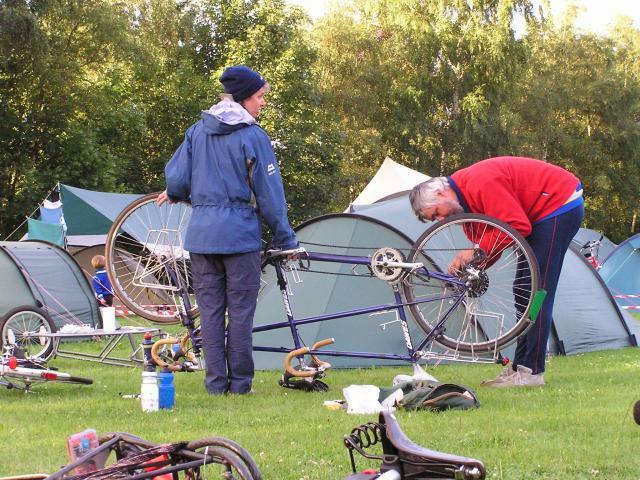 Back at the rally site, Hywel and Jackie Davies sort out the back wheel to their tandem following their earlier puncture. Most mornings there was a kids club and Ceri-Siân helped out. 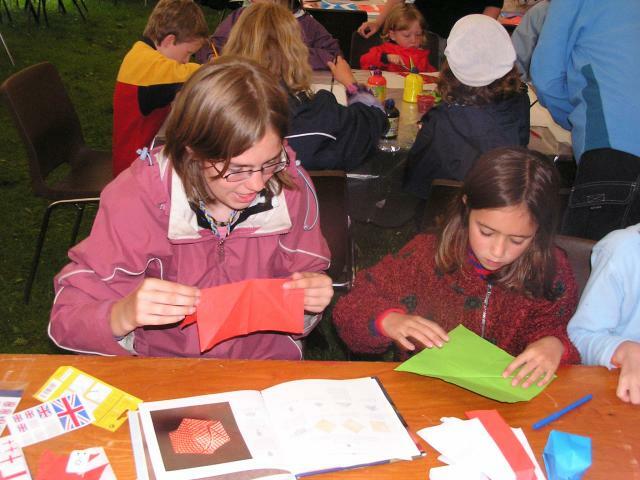 Here she is assisting in an origami session. The fruits of the kids labour. 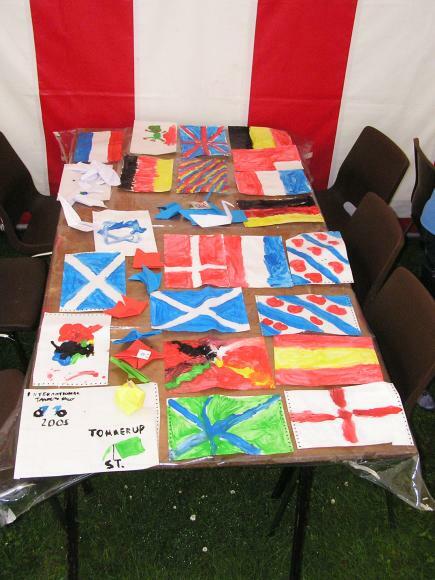 Lots of flags painted some real, others imaginary. Then you went through a second arch. And finally you went through the third arch!